Interlude and a first attempt. I stayed home for the next 10 months, I lived in my dad and step mother’s house in Deep Cove, North Vancouver. When I arrived back from Central America my mom informed me about some health problems she had started to have, she told me that it was nothing to be worried about, it was being taken care of. I spent my time finding new work teaching yoga and pursuing old work, teaching pilates. I had some great job opportunities that I took advantage of but really I was just biding my time, planning my next adventure. I was going to head to SE Asia, this time with a one way ticket, I wasn’t sure when I would be back……. Originally published on facebook – March 10, 2010. The last week before I left was hectic, chores, errands, last meetings with friends etc . So much to do that I didn’t really have time to even look at how I felt about being away for up to a year. I was to leave on Sunday, all week I had been a bit short tempered, not very patient with silly little things that normally would not annoy me. I think I wasn’t feeling, just functioning and doing the things that needed to be done without really acknowledging my emotions. Saturday morning I woke up with an upset stomach, I felt stressed and sad. I dealt with final preparations all day with a sense of heaviness and a churning stomach but looked forward to spending my last night with my family. Finally dinner time arrived, everyone was there, brothers, sister-in-law, other brothers girlfriend, my niece and my parents, most of the people I love the dearest in this world. My Mom gave me a card, Tiger Girl she called me. To my fierce and gentle daughter go a have a big and beautiful adventure, I couldn’t help it and broke down crying, sobbing really. It’s so hard to leave her with the health issues she is dealing with now, I’m struggling with feelings of guilt and selfishness but she assures me I should do this and follow my dreams, this is what she wants for me. She will keep me updated about her health and will let me know if I need to come home. The rest of the night was bittersweet I felt so loved and am crying now just writing this, the screen is all blurry. My Dad and Sharman and Alex gave me a couple of little moleskin notebooks but it was the note with it that set me off again…..a picture of a finger with a string tied around it “wherever you go…remember we love you”, well it set me off again. Don’t worry guys, I couldn’t possibly forget! I brought both of these cards with me, they remind me I am carrying their love with me wherever I go. The end of the night was hard, leaving the house, more tears, long hugs and so much love. Went to mom’s house to spend my last night, I slept in her bed with her, we talked until 2 or 2:30 in the morning, about a lot of different things but it helped to reassure me that I was really doing the right thing, she wanted me to go, she understands how worried I am about her and all my other fears. I love her for understanding so much. The next morning was rushing around to get out the door, some final hugs, love, and tears with Mom and then time to go. A friend was kind enough to get me to the airport, I made it in lots of time for my 11:30am flight, got checked in and was told I had been given an upgrade to executive class for both legs of my flight. I was so numb with emotion still that I barely registered this when the attendant told me but once I got to my seat on the plane it certainly registered, I had my very own cocoon! Was flying Japan Airlines in one of those big double-decker planes. I was on the top deck, kinda neat to go up stairs on an airplane! My seat was huge, it reclined all the way down to a lying position, had an automatic adjustable leg-rest, my own tv and literally 4-5 feet of legroom in front of me. I feel asleep right away and woke up because I heard eating sounds around me. I paged the air hostess and without asking she brought me my meal. I had requested veggie meals and it was really pretty good. After the meal they offered us green tea, regular or coffee, I went for the green tea and it was quite lovely. The service on Japan Air is like nothing I have ever experienced on an airplane before, beautiful, gracious women. After 10 hours we landed in Tokyo, Narita airport. I had a 6 hour stopover here. I tried some Japanese fast food, soba soup with tempura prawns, pretty good but msg heavy. I bought some internet time to see if I had managed to find a reservation in Bangkok, no luck. I tried calling all the places recommended in my lonely planet guide and some other ones I found on the internet, no luck. I was nervous about landing in Bangkok at 11pm at night and not having a firm place to stay the night. I had to stop trying as it was time to catch my next flight. This flight was 7 hours to Bangkok, Japan Air again, upgraded again but not as nice this time, my seat was just like a regular seat but wider and with a lot more legroom, not complaining, still way better then “cattle class”. Once again my veggie meal was excellent. I slept a lot of the way. I made a decision on the flight that I would try to get a flight from Bangkok to Ko Samui as soon as possible, maybe I wouldn’t even need a hotel room. I landed in Bangkok at 11pm on Monday March 8th ( I think that it had been about 24 actual hours since I left Vancouver at this point). I asked at the information desk and found out that 2 airlines offered flights to Ko Samui daily, Bangkok air at 6am and Thai air at 7:30am. Bangkok air didn’t open their ticket office until 5am, but the Thai office was open then so I went to see if any seats were available, there weren’t. I was a little worried but figured I could just hang around the airport, get some more sleep and see if I could get a ticket at 5am with Bangkok air, if that didn’t work out at least I could go to Khao San Road during daylight and find a place to stay. I got lucky though and was able to buy a ticket ($80) to Ko Samui on that 6 am flight. 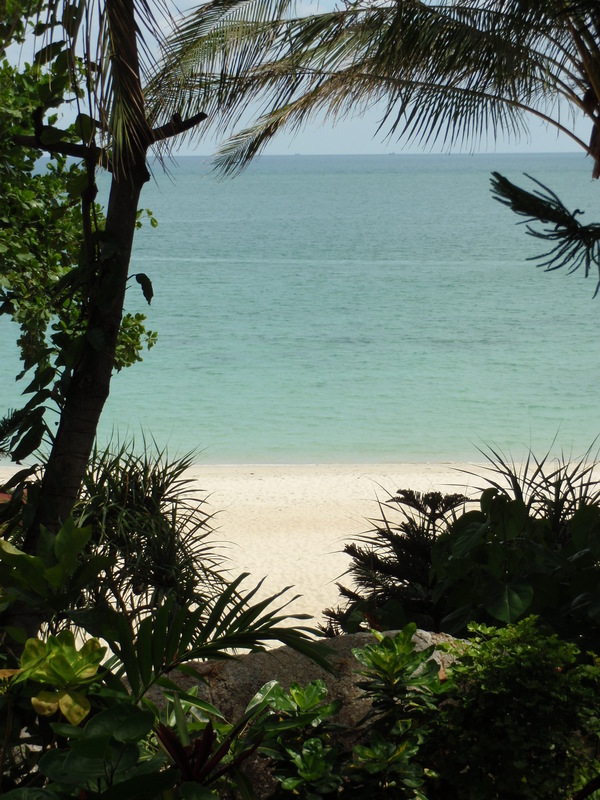 A one hour flight from Bangkok to Ko Samui and when I landed I knew I had made the right choice, I love island life and I could feel the vibe right away, but I wasn’t staying here. I bought a ticket for a ferry ride to Kho Panghan (a smaller island and home of the infamous full moon parties). I caught my ferry at 8 am, it took about 40 minutes. The lady who sold me the ticket told me it would take 20 so when we were still moving after that time I had a few moments of insecurity where I thought that perhaps I had gotten on the wrong ferry, but figured i didn’t really care, it had to be headed somewhere nice 😀 However it turned out to be the right one. I got off and had all the usual touts and taxi drivers surround me, I choose a woman and told her I wanted to go to Ban Cholak Lam, from there I had to catch a longtail boat to my final goal (I had decided this on the ferry). She drove me (just me) in the back of her songthaew (a small pick up truck taxi with 2 benches in the back) from here I had to catch a longtail boat to Bottle Beach. There weren’t any other passengers so they told me I could wait for some more people to show up so the cost would be cheaper. I agreed and walked ten paces to the beach. 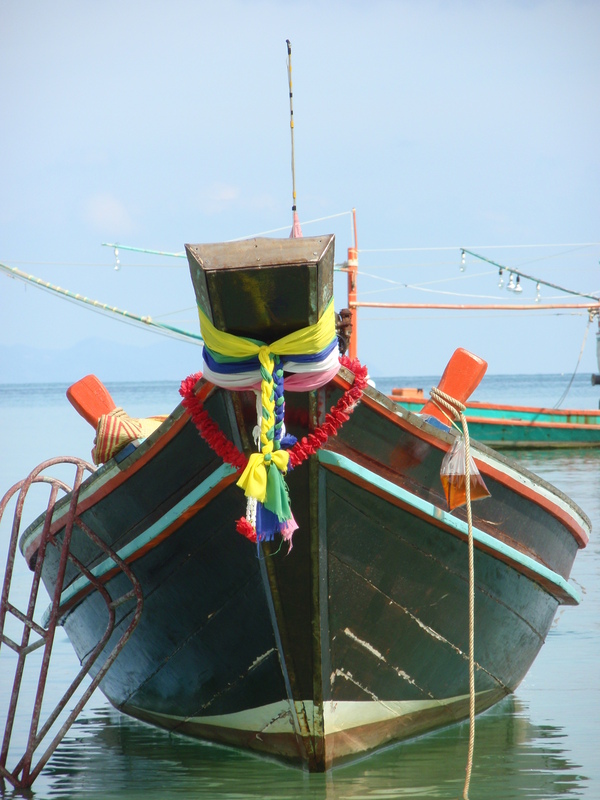 This was a little fishing village, beautiful Thai trawler type boats and longtails everywhere. I took my flip flops off and waded right into the beautiful warm ocean….aaahhhhhhhh! I took a few pictures of the boats and my happy feet and then some other people showed up and we arranged the ride. Hopped in the longtail for my first ride and away we went. What a beautiful country I am in, I wish I took pictures but my camera was up front with my pack, silly me. Amazing coastline, limestone (I think) cliffs and rock formations the whole way, tons of greenery and an endless blue horizon. This boat ride wakes up my feelings, I feel calmer, I feel appreciative and oh so lucky to be here, I feel awed by this beautiful slice of mother nature, I start to feel good about being on this trip. After about 15 or 20 minutes we started to approach a beach and I really couldn’t believe it, it’s small, there are huts scattered along the beach, golden white sand and gorgeous! We land on the beach, it’s hot, I’m sweaty and it’s only 10am. I shoulder my pack and start looking for a place to stay, check out a few rooms and finally settle on the far right side of the beach, at the Smile Bungalows, there is no way I could not stay here with that name :D.
Finally after something like 35 hours of traveling I have arrived. I have my own bungalow with bathroom for 400 baht (about $8) a night, my bed has a real mosquito net covering around it, it feels very romantic and sort of creates a soft secure feeling in me when I am inside it. My bungalow is set up a hill about 15 meters away from the beach, I have a porch with chairs and a view of the beach through the trees. There is a good restaurant, the food is cheap and a nice family runs the place. I spend the rest of my day lounging the sunshine, reading and just relaxing into the place. My first dinner I had Thai chili basil chicken with rice, they asked me how spicy I would like it, I said I like spicy so he says medium then? Ok….was really, really good but maybe I’ll go mild-medium next time, lol. I had an early night and slept for almost 12 hours. I think I will stay here at least few days, get my tan on and just relax into my Thai experience. I started thinking about visiting Thailand when I was in my early 20’s and dating J. We had a trip planned then but we broke up before it happened. Then life got away from me for quite a few years and I let the traveling dreams slide away. They came back about 5 years ago and this trip I am on now was in the works before I met J. (a different one), which derailed it yet again. Well, I’m finally here. Thanks to all of you who encouraged and supported me and helped me to get here, I love you. I made it!!!!!! I spent about 3 glorious weeks on Bottle Beach and met some very wonderful people, many of who I have stayed in touch with and am now proud to call friends, but one night I got an email from my mother. Her health problems had worsened, it was cancer and she needed me at home as the doctors had advised that she do a series of chemotherapy. I was on the plane home 3 days later. We found a place to live together so I could be her support and for the next 6 months that is what I did. Finally the doctors gave her good news, she had responded very positively to the chemo and was doing really well, energetic and happy and so she encouraged me to go travel again as she knew it was my dream. I agreed to go for 3 months, I wanted to be able to come back and check in on her in person, I booked the tickets, heading to Hanoi in Vietnam this time, hoping to hit up Cambodia, Laos and Thailand as well in this short time, I would be back in Vancouver the day before Christmas Eve day.